With several hours of sunshine most days this past week, spring really seems nearer. The birds are very active and the hazel pollen is already blowing around. And the first crocus have opened! Today’s shot looks similar to last week… not much change yet, except for the light. Are you noticing any changes yet? This entry was posted in Garden, Nature, Tuesday View and tagged Garden, Nature, Seasons, The Tuesday View, Winter. Bookmark the permalink. Yes, the change in the light when the sun shines is wonderful. It seems to be months since we have seen the sun, I’m out there as soon as it starts shining! Just how I feel Pauline! This winter has been prdominantly grey, but not as bad as last year where we literally didn’t have a glimpse of the sun at all for weeks on end. Hope it’s sunny for you this week! Oh my yes, noticing lots of changes. The light is a big part of it. Also, Cathy, I have thoroughly enjoyed and appreciated your recipes this winter! Thank you. Oh Cathy how lovely. I love crocuses especially ones such as those. We are a little behind you I think on the progression towards spring but not far. The buds on the trees are forming and little green shoots are sprouting up all over. Oh yes, I can feel it. Many birds are singing and preparing for the breeding season. It was lovely hearing them yesterday, and we heard the first green woodpecker drilling and “laughing” too! Wonderful! Friends of mine have heard the green woodpecker too. This year the bird´s population shall be counted and I have to listen. – Bird of the year in Germany! There is a much warmer and kinder feel to the days this week, lots of bird song too. Hurrah! Glad it’s warming up for you too Julie. Anticipating spring is always a wonderful feeling isn’t it! And so welcome after months without colour! Have a nice week Arthur! I can see your sunshine! Our gloom may be getting less and we are still very mild. I saw your post with crocuses too – let’s just keep our fingers crossed that there aren’t any nasty late frosts! Yes, it really does fell like spring now, although friends have said that they heard that more cold weather was coming – I’m being positive and not believing them! The longer days are lovely aren’t they – especially when they’re longer, sunny days. Good to see the flowers starting to open too… not so sure about the weeds starting to grow again though! I shall ignore the weeds for a bit longer… 😉 Have a sunny week Sarah! 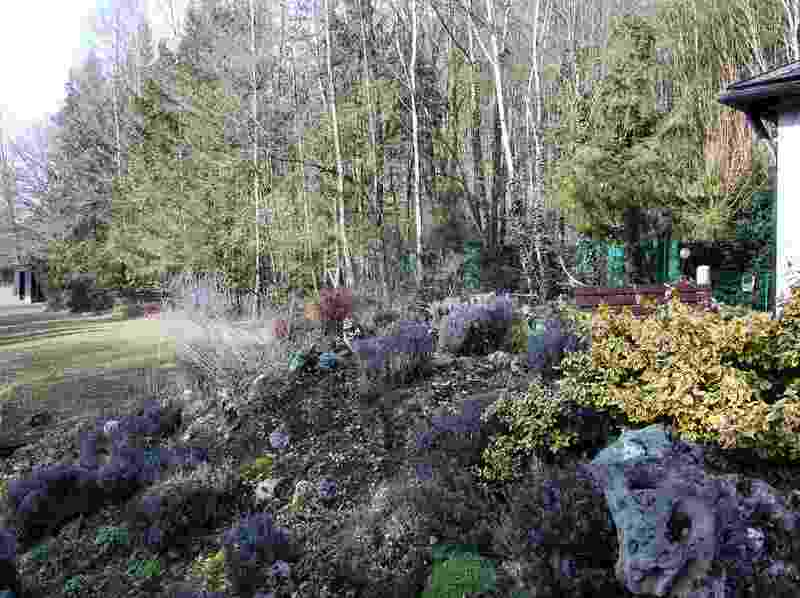 I have not had a chance to stop by in a while, so this may be really late in coming, but I love your header picture of the moss and lichen – so beautiful! Nooo it’s not fair! In past years we’ve been on a similar climate scale, what happenen? We have started to see the time change as well, can’t wait for spring. You crocus are pretty, mine have not ever started to break ground yet. I bet you are 3-4 weeks ahead of us. 🙂 Snow is nearly gone now, really warm to day. Crocus seem like such happy flowers. I have seen a couple in our neighborhood, but in general, spring is slower than in the last two years. Today was around 60F, lovely warm afternoon for finally getting some garden chores started. I agree – crocuses and daffodils seem to smile! 60F sounds nice… It’s still a little cool here, around 10C(50F) yesterday, but only about 40F so far today. Enjoy your gardening Susie! Changes? Oh yeah, we got another 6″ of snow. But thanks for sharing your crocuses, they remind me winter won’t last forever! You poor things. I’ll share the next blooms with you too, but it must be so frustrating. I’ve been envious of the UK sites I visit where there have been hellbores and snowdrops out since Christmas! What beautiful crocus, Cathy! They do give a hint that spring is coming! The biggest change I see in my garden is a return of all the little finches. They just were not to be seen during the months of December and January. The other day I could hear all of the little birds making lots of lovely sound, and I realized I hadn’t been hearing nearly enough of their song and chirping! Spring is almost here! The changing light, the longer days, the crocuses, here too there are signs of bwinter letting go and ceding to spring. Wonderful isn’t it! Absolutely Janet. And sharing this feeling with like-minded people is great too! 😀 Thanks for your comment, and have a good week – hope you get some sunshine! We see the change in the light first…and I wouldn’t be surprised to find, when the snowpack melts, that there are snowdrops underneath, ready to bloom! 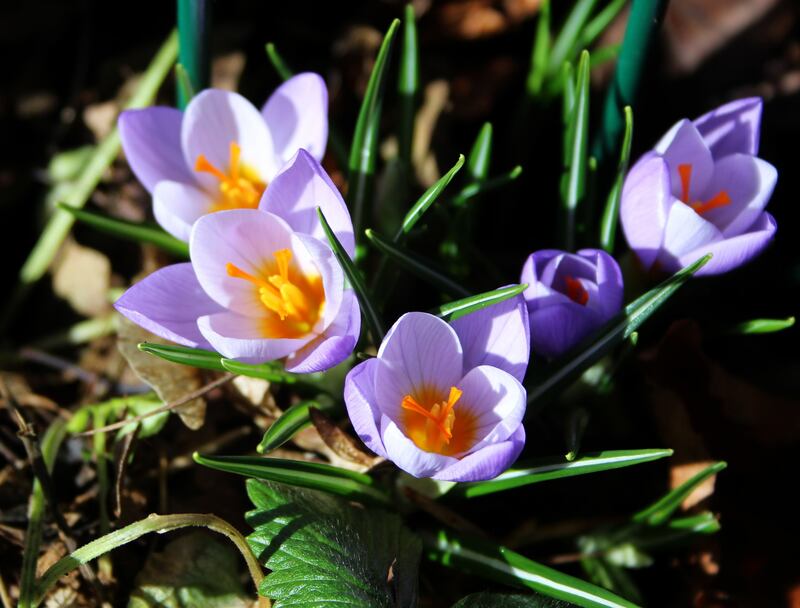 Thanks for sharing that crocus – a view of things to come! Hope you get some nice warm sun soon Marie… I know from last winter how amazing it is what you can find under a pile of snow! Wow! This makes me long for spring so bad!!! 😀 Beatiful photo! We had an awful lot of pollen from the fir trees last year, so hope this year won’t be quite so bad. The hazel always produces clouds of it though!